The Euro Cuisine Stainless Steel Steam Juicer, with our specially designed spigot, will extract 100% pure and delicious juice with the power of steam from all sorts of fruits and vegetable. All the juicing is done right on your stove top. To extract a high-volume of juice - just add fresh fruit or vegetables into the steamer basket, fill the water reservoir with water, and gently bring the water to a boil on your stovetop. The steam process will open the juice cells in the fruit and extract juice, which will drip into the juice container with spigot. Once the juice is ready, use the spigot to drain the juice from the juice container into bottles or jars. Enjoy drinking the vitamin-rich juice fresh, or save it for making jelly and syrup. Garlic has long been popular for many reasons, from health benefits to simply flavoring food. More than just a delicious flavoring, it has also been associated with preventing cancer, diabetes, heart disease and infections. In the culinary world, roasting garlic is a favorite of many chef's palettes, but is a time consuming method for chefs and home users alike. Fortunately, those days are over with the Roasted Garlic Express. This unit roasts garlic in just 27 minutes, and makes use of an automatic shut off feature to prevent burning. The roaster uses a terra cotta clay piece, to cover the heating element, that provides even heating without direct contact. Simply fill the nonstick roasting dish with the desired number of garlic bulbs, along with three tablespoons of oil per bulb. Place the bulbs cut-side down, close the lid and power the machine on. Press the start button and the roasting cycle begins, automatically bringing it to the right temperature and amount of time. You can also adjust the time to cook eggs or even muffins. Cleaning is a snap due to the non-stick interior, and the roasting handle is completely detachable. In addition, the cord stores underneath the unit to keep countertops clean and storage a breeze. Seasoned with oil for a natural, easy release finish that improves with use. Essential for the complete kitchen, including a skillet, a grill pan, a griddle, a set of pan scrapers, a silicone pot holder and a silicone hot handle holder. The right tools to sear, sauti, simmer, braise, broil, bake, roast or fry. At home in the oven, on the stove, on the grill or over the campfire. Accessories are dishwasher safe and heat resistant to 4500 F / 2320 C (pot holder up to 2500/1210C). Not for use in oven. 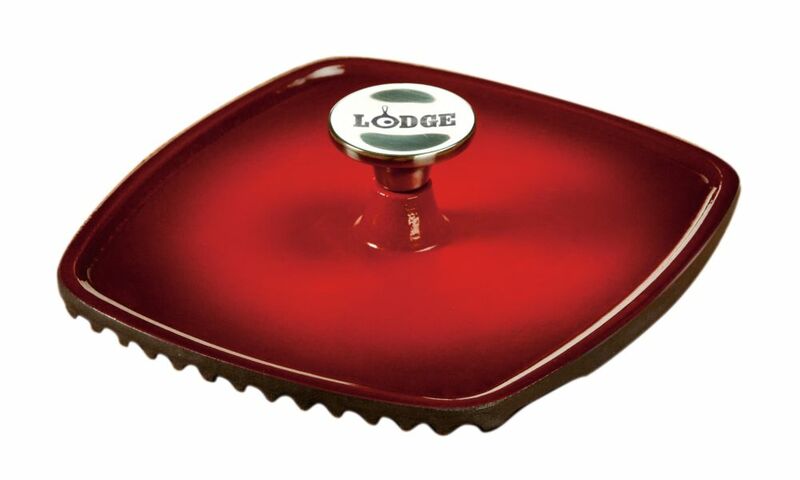 Enamel Panini Press Red Since 1896, the Lodge family has been making cast iron cookware of the highest quality. We always strive to provide an unmatched experience at the greatest value. As times change and techniques evolve, we look to pioneer progress, but always with our roots firmly in place. Lodge's century-old tradition of excellence continues as we marry the benefits of cast iron with the beauty of porcelain enamel. Our enameled cast iron is made to our strict specifications by our partner foundry in China.